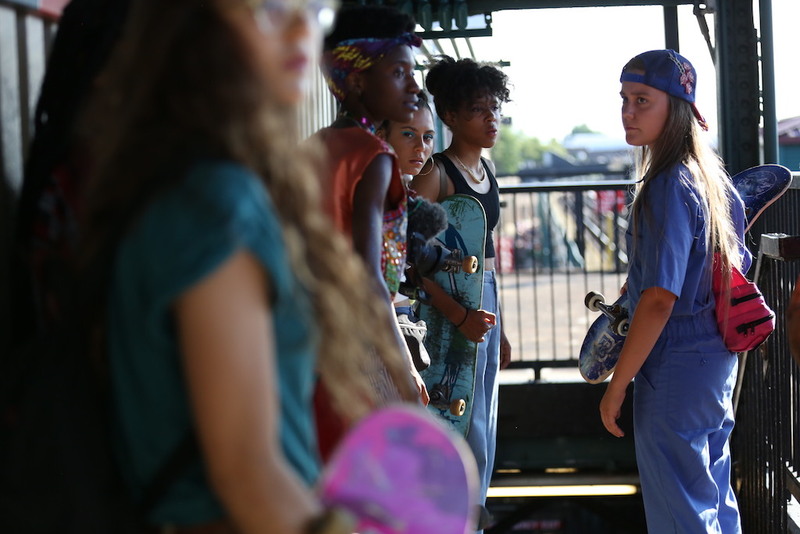 At first glance director Crystal Moselle‘s first feature-length drama Skate Kitchen plays out almost like a documentary. Not in terms of talking heads, but in the way the film’s shots lend proceedings a slice of life feel. Were it not for the occasional moments of clearly scripted teen angst, you could easily mistake it all as fly-on-the-wall footage. Aforementioned angst-ridden drama kicks things off in muted fashion, as awkward teen-skater Camille (Rachelle Vinberg) falls out with her overprotective mother over her skating (Camille having recently injured herself whilst attempting a stunt). Moving away from home and venturing to New York City, she falls in with an all-girl skate crew, who slowly begin to pry her from out of her shell through their anti-authoritarian, give no s**ts attitude to life. Also, they skate. A lot. It’s your average ‘awkward shy girl’ story, only with lots more kickflips and heelflips. It’s also incredibly bland and lacking in any kind of emotional hook. Camille runs away from home after the briefest of arguments with her mother, but this hardly feels like a problem to overcome. Likewise, when Camille starts to fall for her best friend’s ex-boyfriend (Jaden Smith), the unfolding drama is painfully muted and drawn out, before ending in an anti-climax wherein everything magically sorts itself out because the credits are waiting impatiently to roll. The performances are nothing special either, with most of the actors delivering their lines in a manner that suggests a lack of engagement or utter boredom. It’s clear the director intends a more realistic, life-like performance from her characters (again, in service of the fly-on-the-wall feel), but it makes for a rather uninviting 100 minutes or so. There are moments of life, but not enough to keep hold of attention spans for long. Dry as it gets, the film is refreshing in the way it explores identity, gender and sexuality within the main characters, depicting them in such an non-showy, altogether natural way, as opposed to making these themes central to the plot. However, it begins to feel perfunctory once we reach the halfway point and discover that the film is slogging along with not much to offer in terms of conflict or drama. The skateboarding sequences offer some excitement and quicken the pace somewhat, whilst Shabier Kirchner‘s cinematography is beautifully lit and framed throughout, lending New York a grungy but inviting, sun-drenched feel. despite all this though, there’s no escaping the drudgery or lack of character. Skate Kitchen may feel like an indie-drama/documentary hybrid, but this does both genres a disservice. There are moments of technical brilliance within the film, and a couple of chuckles are elicited, but for the most-part the film coasts, offering little-to-none in terms of emotional engagement and problems for the characters to overcome. Skate Kitchen is in UK Cinemas from 28 September. Tags: Ajani Russell, Brenn Lorenzo, Crystal Moselle, Jaden Smith, Jules Lorenzo, Kabrina Adams, Nina Moran, Rachelle Vinberg, Skate Kitchen. Bookmark the permalink.